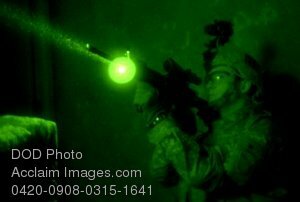 Description: Free, public domain image: Army Soldier Guarding a Stairwell-Night Vision. A U.S. Army Soldier from Alpha Company, 3rd Brigade Combat Team, 101st Airborne Division guards a stairwell while the rest of his team clears the house Nov. 16, 2007, during a combat operation near Baghdad, Iraq. (U.S. Army photo by Spc. Luke Thornberry).